As you know the pupils from the Borders have been given the opportunity to excavate an archaeological burial. 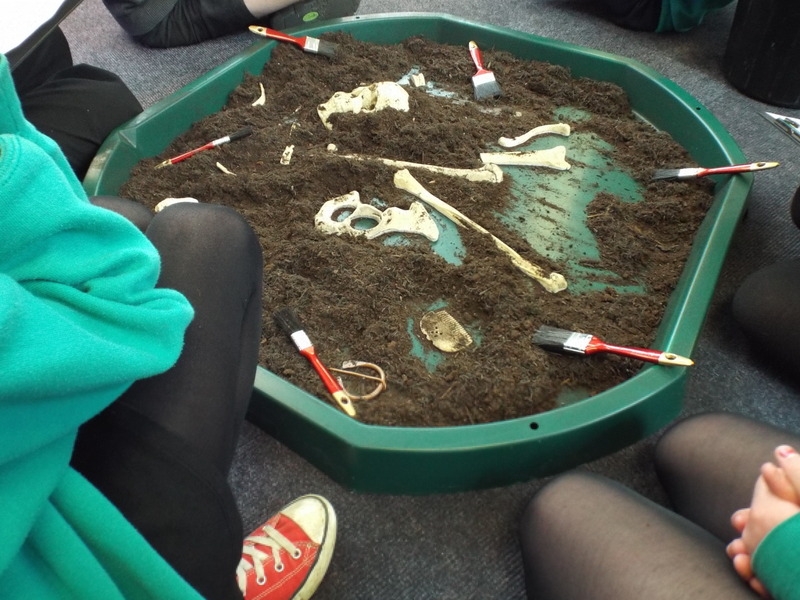 Each class had 4 dig boxes with “human bone” and a range of artefacts that gave them clues to who this person was when he/she was alive. They were then placed in teams and collaborated together to come up with an interpretation on who this person might be when they lived. Our Primary 5 and 7 classes recently had a visit from heritage heroes outreach and it was a brilliant experience. The children were firstly taught about the work of an archaeologist through an answer and question session. The children were able to use prior learning to figure out the important duties carried out by an archaeologist. They then had great fun outdoors excavating an replica of an archaeological dig and analysing their finding in an attempt to discover who the remains belonged too. The children developed a range of skills including talking and listening, analytical questioning and answering, enquiry, evaluating and much more. Not only have the children taken part in a worthwhile experience but teachers also gained knowledge and experiences which can be re-used in future lessons.